The single has been recorded by the stars of The Big Reunion - namely Blue, B*witched, Atomic Kitten, 5ive, Liberty X and Honeyz in aid of the ITV umbrella charity Text Santa. The release dates are Sunday 15th December 2013 [download] and Monday 16th December 2013 [CDS]. The stars of The Big Reunion having a Wizzard time recording Roy's Christmas classic! 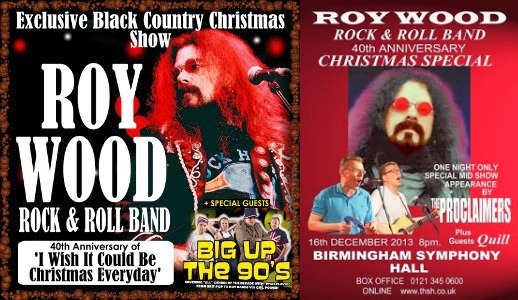 ELO Beatles Forever [ELOBF] recommends Roy Wood to those enlightened folks who enjoy the music of ELO, Jeff Lynne, The Move, Wizzard, The Idle Race, 'Brum Beat', The Beatles and related artistes.